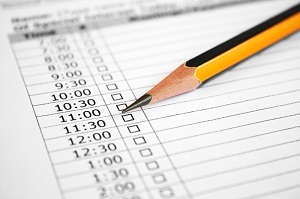 Still wondering how to fit exercise into a busy schedule? Your days are filled from the time you get up until the time you fall into bed exhausted at night, but believe it or not, you still have time to fit some exercise into your day. Here are six ways that you can use to fit exercise into your already busy schedule. Just make the time. Initially, it will be a change, but if you can fit in two or three workouts of just 30 minutes a week, you’ll be well on your way to fitness. Make lunch hour exercise hour. Take a half an hour to do some exercise. You can even make it a social affair and invite your work friends to join you in a walk. Studies show that when you have an exercise buddy, you exercise more. The thinking is that we will go and exercise so we don’t let the other person down. Exercise early in the day. The easiest way to ensure that you’ll exercise for the day is by getting the exercise in early, usually the first thing in the morning. After a little while, it will become a habit and won’t be as difficult having to get up a little earlier. You can exercise and do something else at the same time. Read, watch t.v., even chat on the phone with a friend, all while you workout. Instead of exercise taking you away from family time, make family time a time for some fitness for all. Go for a walk, play soccer at the park, play a game of baseball in the backyard. You and your family will feel much better. If you still don’t think that you have time for any of the above, you definitely have time to fit some type of activity in to get you fit. Here are three easy tips: do your exercises during commercials, while you cook and before using the bathroom. You can easily get in two or three minutes of exercise each time with this method. Do this all throughout the day. Keep doing it day after day and you’ll notice the cumulative effect. And for the most part, you won’t even break a sweat. To top things off, short spurts of exercise are proven to do a better job at speeding up the rate of your metabolism than longer workouts. You can try jump rope, doing situps, pushups, wall squats, body weight squats, or jump on a mini-trampoline. Do high intensity, short interval exercises for five minutes straight. A great exercise for this would be body weight squats. See how many you can do in five minutes. If you manage to make it through this, you can call it a day for exercise after that. Another option is running up and down the stairs for five minutes straight. Five minutes of this and you’ll know you’ve done something, which explains why you only need to do five minutes of this a day. It doesn’t have to take a lot of exercise or a lot of time to achieve results. Fit a little something into your busy days and you will be well on your way to getting fit.